Energy-efficient motors are being utilized in multiple fields such as industrial, commercial building, residential, and agricultural sector among others. Higher efficiency of these motors coupled with low maintenance costs has resulted in increase in demand for various applications. There has been continuous innovation in this technology to reduce the consumption of electricity. Tis has directly increased its applications in material handling, material processing and HVAC, pumps among others. The key opportunities for the market are being generated through the industrial sector and global adoption of international standard during the forecast period. Government regulations also offer additional incentives for manufacturers to follow standards like Minimum Energy Performance Standards and Environment Protection Act in motor production. Growing awareness of about environment is also driving the adoption of energy efficient applications in various applications. The major drivers for the energy efficient motors market is lower power consumption and low maintenance. However, the market growth is estimated to be restrained owing to the higher cost. This report identifies the global Energy Efficient Motor market size in for the year 2014-2016, and forecast of the same for year 2021. 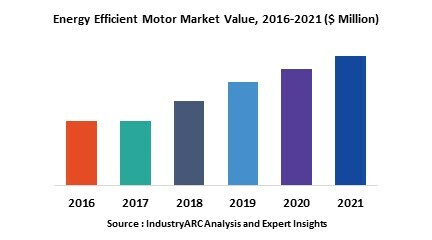 It also highlights the potential growth opportunities in the coming years, while also reviewing the market drivers, restraints, growth indicators, challenges, market dynamics, competitive landscape, and other key aspects with respect to global Energy Efficient Motor market. Geographically Europe is estimated to dominate the global energy efficient motor market, followed by the North America. 11.6. Kirloskar Electric Company Ltd.